Whether it's an artist's or photographer's individual work, or a large or small exhibition or installation, we are experts at all aspects of presentation. 9 Surf Editions is a one-stop production studio for fine art digital archival printing, framing, and preparing an exhibit to museum standards. At the start, we design a down-to-the-inch mock up of the entire exhibit, creating an exact digital representation of the proposed exhibition and space, including all details such as frame styling and mat sizes and depths, and a layout of all images as they would be mounted in precisely measured spaces. Our process establishes the planning early and gives everyone a tight blueprint to keep all aspects of production on schedule. Every exhibition has it's own unique requirements. 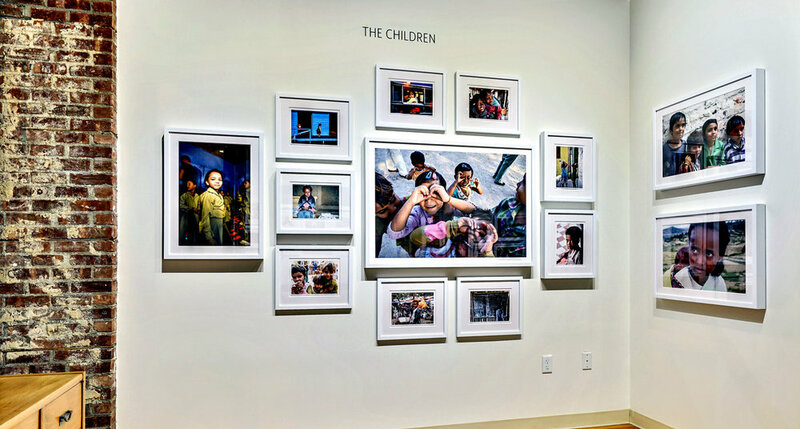 We work with key stakeholders, artists, curators, and program managers to design a cohesive exhibit, including image selection, placement, size relationships, image presentation, etc., all geared for maximum viewer engagement. Our digital print studio produces museum quality archival pigment prints of all sizes. We work with film negatives, slide film and digital originals. If the art or photograph exists only as an analog image, we will photograph or scan the originals. Our expert color mastering and use of cotton rag and fibre papers produces the best possible results. The Studio has the capability of producing all size prints on many different kinds of archival media. Presentation of photographic prints and artwork is key to the success of an exhibit. We work with you to establish a framing/mounting plan and budget. Depending on the location, insurance, building requirements, unions, etc., we may be available to mount the exhibit also. Looking for a space to present an exhibition? The studio is located in a beautiful gallery (see the photos above) in Asbury Park, in the heart of a major urban renaissance. Call for details or send us a note and we will contact you. Have a project you'd like to talk with us about?